Back row, from left: Geralyn Arndt, Deborah Willhite, Theresa Davidson, Megan Dix and Ann Fullen. Middle, from left: Sharman Murphy, Kay Carl, Jackie Medina, Melinda Flohr, Lyle Klamm, Dave Leiker, Diana Wilhite, Christina Pletcher and Pam Brunner. Front: Lynette Yevak, Carol Mitchell, Karen Hudson, Mary Beth Janssen, Brenda Kahle, Linda Baumann and Donna Russell. Thirty-two retiring teachers, administrators and school support staff members were guests of honor at the annual Emporia Public Schools Staff Recognition May 18 at Emporia High School. 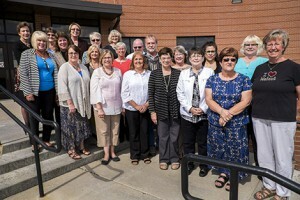 “Collectively, these individuals have devoted more than 700 years to Emporia Public Schools. Over a span of four decades, they have had a huge impact on the lives of children in our community,” said Superintendent Theresa Davidson. Retiring staff members are: Geralyn Arndt, administrative assistant; Linda Baumann, vision specialist; Pam Brunner, Technology Department; Kay Carl, Emporia Middle School math; Theresa Davidson, superintendent; Megan Dix, paraeducator; Ron Douglas, Transportation Department; Melinda Flohr, orchestra; Ann Fullen, district secretary; Jennie Hoy, Food Service Department; Karen Hudson, EMS library clerk; Mary Beth Janssen, EMS librarian. Also Brenda Kahle, student records management; Jane King, student records management; Lyle Klamm, Maintenance Department; Dave Leiker, Technology Department; John Lexow, Emporia High School English as a second language; Larry Matson, Transportation Department; Jackie Medina, Timmerman instructional strategist; Carol Mitchell, Timmerman librarian & art; Sharman Murphy, EHS paraeducator; Karen Myers, EHS language arts. Also Dennis Newell, EHS math & science; Christina Pletcher, EMS computer applications; Steve Pletcher, Riverside physical education; Donna Russell, Walnut teacher aide; Carmaine Ternes, EHS librarian; Phillip Thornton, EHS language arts; Diana Wilhite, EMS computer applications; Deborah Willhite, Food Service Department; Lynette Yevak, EHS Family & Consumer Sciences; and Steve Ziegler, Food Service Department. During the program, Davidson and Board of Education members Susan Brinkman, Doug Epp, Art Gutierrez and Colleen Mitchell also presented service awards to 32 employees with 15, 25 and 35 years of service. Employees with 35 years of service are: Johnny Drake and Dennis Newell. Fifteen-year service awards were given to: Susana Aranda, Eleanor Browning, Natividad Crtagena, Evenlyn Cunningham, Tamara Dall, Debra Fancher, Rosa Gonzalez, Amanda Hendry, Margaret Henricks, Stacey Johnston, Lana Knuth, Lisa Longcor, Bill Nienstedt, Tonya Nyman, Rocky Price, Janie Romeiser, Linda Turney, Leza Underwood, Lupe Williams and Dana Witten. Emporia NEA gave special recognition to 2016 Emporia Master Teacher JoAnn McRell, a language arts teacher at Emporia Middle School.